Daniel Sturridge lasted just three minutes at Stamford Bridge last night as West Brom were beaten by Chelsea. WEST BROMWICH ALBION manager Alan Pardew hopes striker Daniel Sturridge will only miss a “couple of weeks” after being injured at Chelsea last night. The striker, on loan from Liverpool, started the match at Stamford Bridge but had to be replaced by Jay Rodriguez after just thee minutes because of a muscle injury. The Baggies went on to lose the game 3-0 after a brilliant double from Eden Hazard. Sturridge has suffered through his share of injury difficulties over the years, but Pardew is optimistic this particular issue will only see him out for weeks rather than months. “It was a blow to lose Daniel on his first run,” Pardew told Sky Sports. “That didn’t give us the perfect start. We just can’t seem to get the goals that get us the wins, and they need to come, and come quickly, so Daniel’s recovery will be important now — we need to get him back. 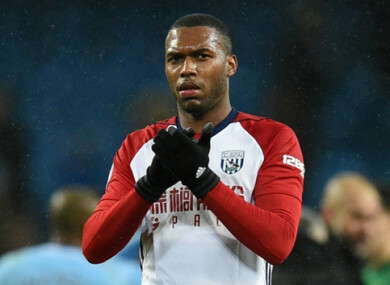 Sturridge joined the Baggies on loan last month in the hope of securing more playing time to boost his chances of making England’s World Cup squad this summer, but he now faces a spell on the sidelines after just three appearances with West Brom. West Brom sit at the bottom of the Premier League table following the loss, seven points adrift of safety. Email “'It was a blow to lose Daniel on his first run... we need to get him back'”. Feedback on “'It was a blow to lose Daniel on his first run... we need to get him back'”.